When I started researching about investing at the age of 16, I only believed in value investing. The idea of buying things cheaply intuitively made sense. You’d find me constantly researching and reading value investing books night after night. As each company I researched had different business models and economics moats, a lot of my earlier methods of analyzing stocks weren’t systematic and therefore couldn’t really be tested. Besides where could a teenager get his hands on data back in 2006. I stopped all my efforts in discretionary value investing in early 2010 but 2 years today, I finally could put my earlier ideas to test. Let me define some of my ideas for researching companies. There are a lot of ways to value a company. Be it using earning projections to discount future cash flows to deriving value from assets in the balance sheet, many value investors can only agree that value is dependent on how one defines it. For myself, I didn’t like outright projections of earnings due to the myriad of factors and assumptions I had to make regarding the future. Instead I placed heavy emphasis on assets on the balance sheet which really took out companies that weren’t heavily asset backed. Within the balance sheet, I really just simply looked at how healthy things were. The ratio of liquid assets verses long term debt and short term debt should be healthy. The current price should be trading near its book value per share minus liquid cash. Profit margins should be high indicating market share. 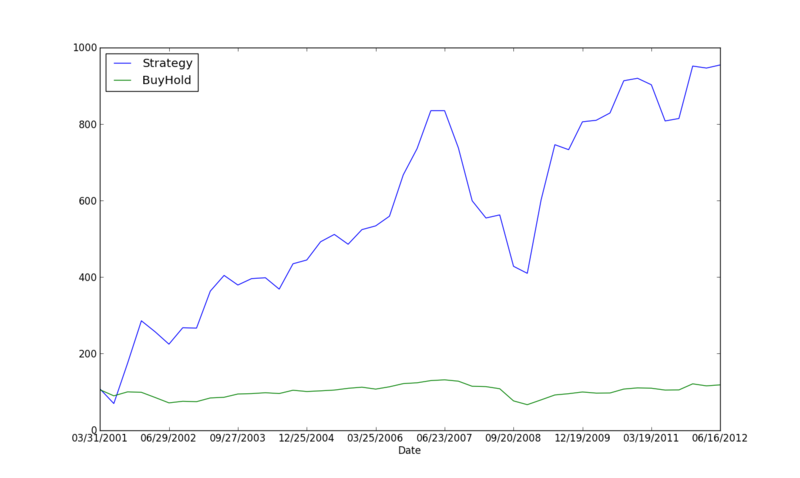 One of my favourite ratios to look at is comparing trailing 12 month net income to total debt. Reason being the higher it is, the more assured I am that the company can pay money back to it creditors. These are just some of the analysis I do but what comes after is entirely subjective hence hard to know if its lucky or hard work. To test my earlier methods of analyzing stocks, I have created a stock screen that screens and buys stocks based on the following 2 conditions. The simple strategy multiplied the initial capital by more than 8 times compared to the benchmark which barely moved in the past decade. Its true that no matter how nice a business or its fundamentals are, a rising tide lifts all boats. Simply running this stock screen, the investor would face drawdowns of 50%, a bit more than holding the SP500 which endured a 49% MaxDD. What risk management measures can be implemented to improve the performance? From the above image, one can see that there indeed is a reduction in risk associated with the modified strategy. Although Sharpe improved by 2.8%, MAR improved by 74%. Further research I think may improve results is ranking each quarters signals by some measure of price, volume, or volatility. This was really an eye opener as I would never have dreamt of actually testing my earlier methods in such a manner. I always thought that value investing would be more of an art compared to systematic trading. In the future I hope to start messing together my research in value and momentum to show that combining uncorrelated edges improves performance. In 2006, Cambria Investment Management published a paper that gained wide spread popularity where it proposed that applying a long term 10 month SMA to assets classes (rules below) to trade them would effectively cut the drawdown while preserving the equity like return. Such a simple trend following method paired with ease of access to exchange traded funds for exposure has helped made the idea very popular. I proposed a similar idea. Instead of applying a SMA to the asset classes, one would instead calculate a X month SMA of a buy and hold strategy’s equity curve. If the equity curve ever dips below the equity curve SMA, we will go to cash. In effect we are forming a hedge against our own equity curve. 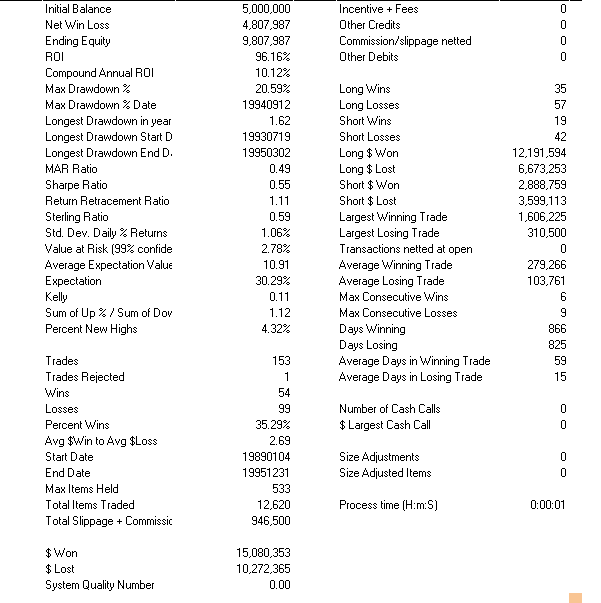 Below are the results for trading the S&P 500 Index, ETF data are limited so I used underlying total return index as proxy. 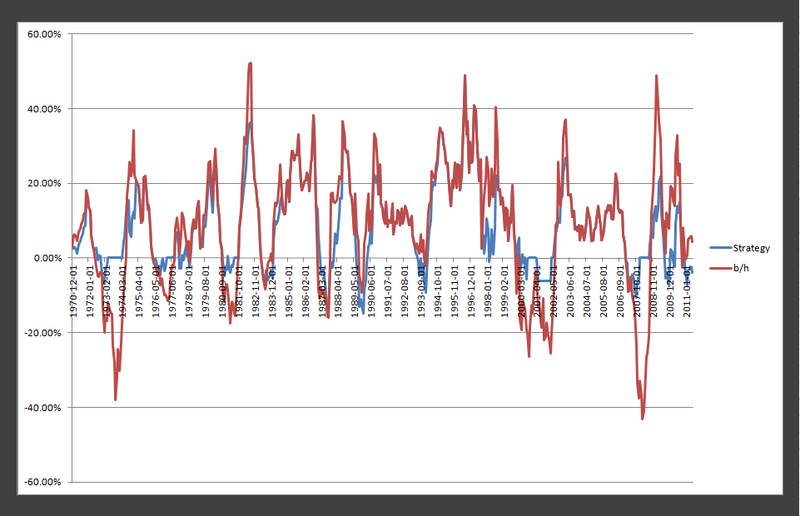 Data from 1988 to 2011 are total return, but 1970 to 1988 are normal composite data. I know that the numbers are probably a bit off and one should take it as instructive purposes.Test duration are from 1970 to 2012 (May). No commission or slippage accounted for. All signals are taken the following days open. 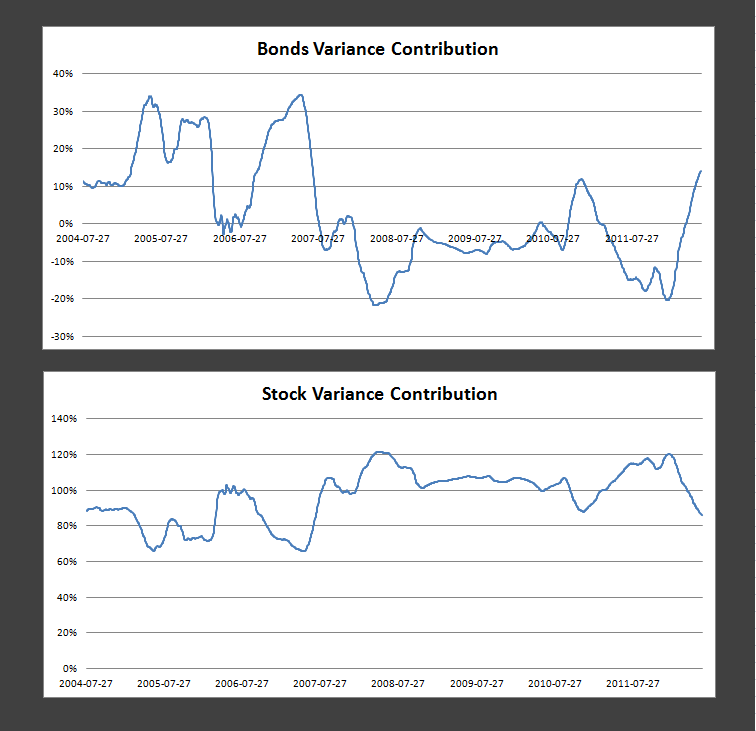 Th equity curve in the above image shows that it has avoided the last two major bear markets. It preserves return through being on the sidelines. 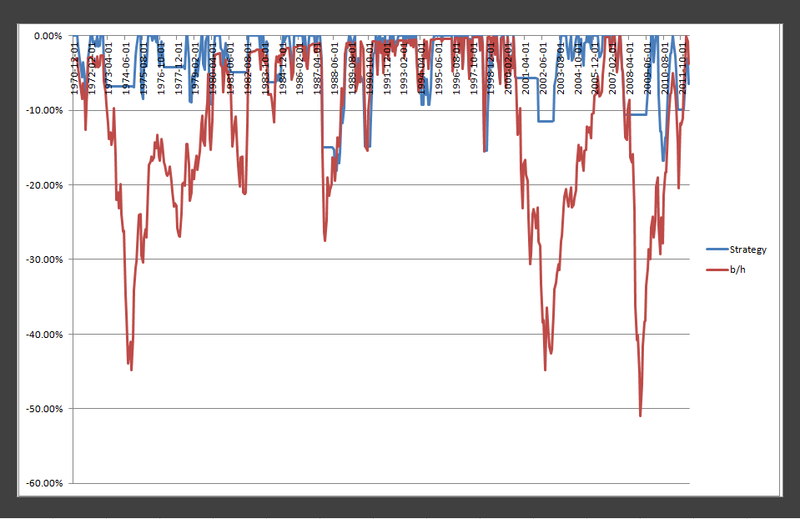 The above Drawdown for the entire test period confirms that the strategy is able to weather storms! 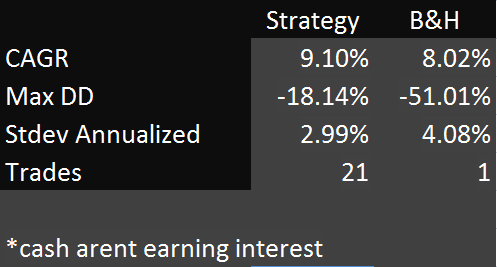 Below is the rolling 10 month return of the strategy. You can see that it replicates the upside buy and hold return very well while. Pretty consistent across time. I believe that there can be a lot of ideas that can be paired with this method. 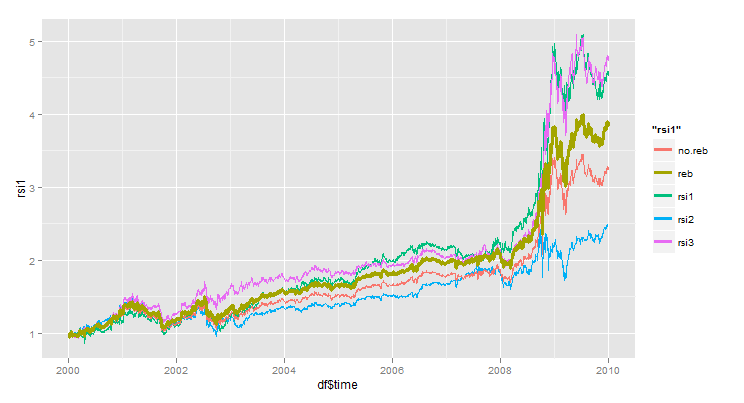 One such extensions I dreamt about was using traditional methods of portfolio optimization to form portfolio of assets that meet criteria like Minimum variance or risk parity. Overlay this method to only participate in the upside and staying in cash or investing in bonds when equity curve is below its SMA. You are bounded by your own imagination. 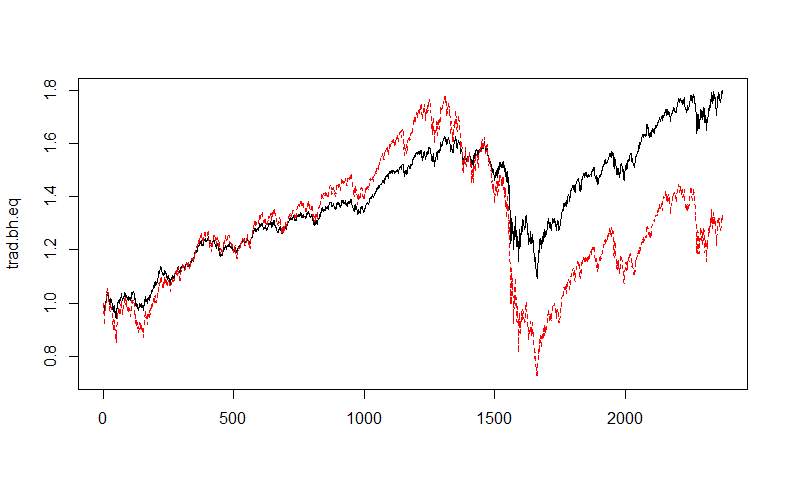 I mentioned yesterday about the advantages in widening stops for trend following systems in the developing stage. Here are a few charts that should be of interest. 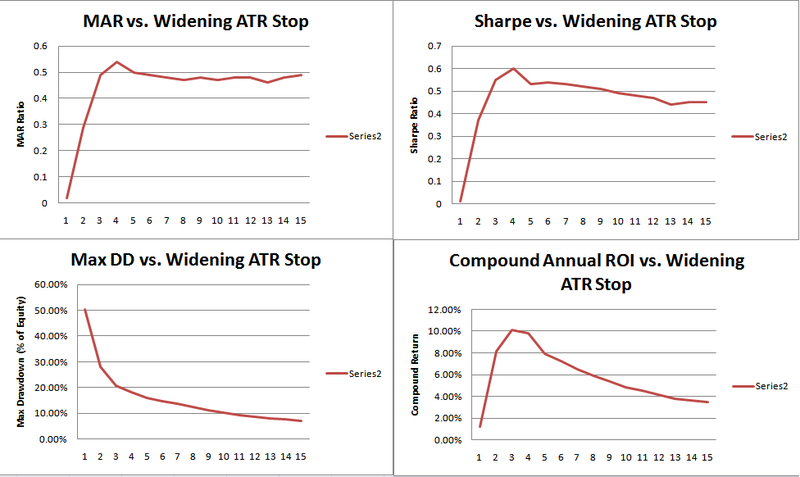 The x-axis represents positive increment of initial stop ATR multiplier starting from 1 to 8 in steps of 0.5. 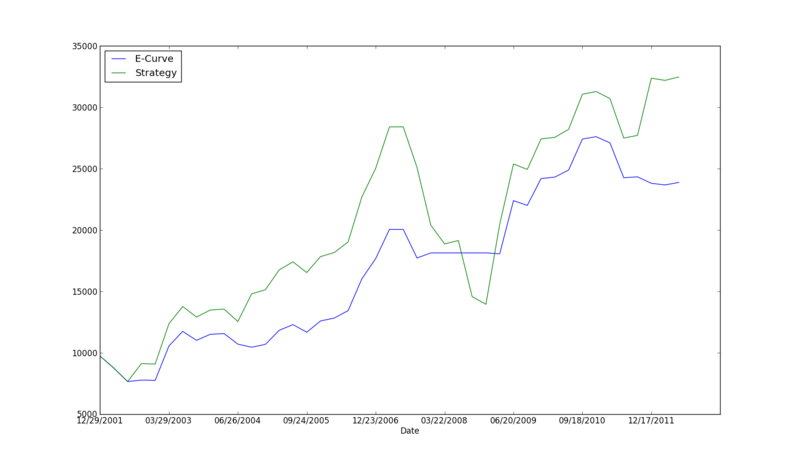 As you can see, it helped the system in test to reduce drawdown significantly. Even till now I still am hindered by inexperience in systematic trend following. 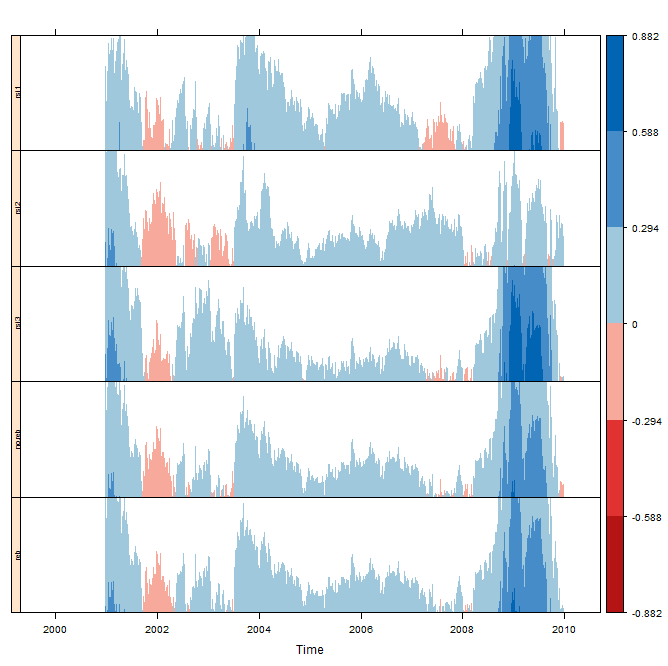 A few days back when reading a book, I came up with a new filter which I was convinced it would offer a better view of the trend. I implemented this new filter and it drastically improved results. The older system used a moving average cross over filter for identifying the long term trend while the new filter used a another form of moving average to do the same job. Above are the attached images of the differences. The significant difference was due to a better and more efficient way of identifying trends as it greatly decreased whipsaws. Equity curve was a lot more smoother. 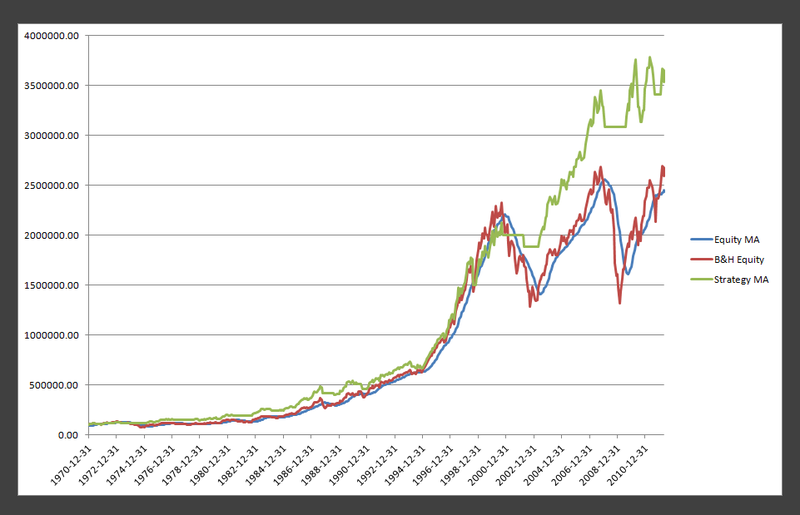 Enough with the filter stuff and coming back to the fundamentals of trend following. My first system used a 4 ATR stop from start to stop. I gave little attention to selecting the numbers but then the idea behind this was to ensure winning trades get their way instead of cutting profits short. Attached below is monthly return distribution. As you can see, the distribution has a shape like a positive skew. 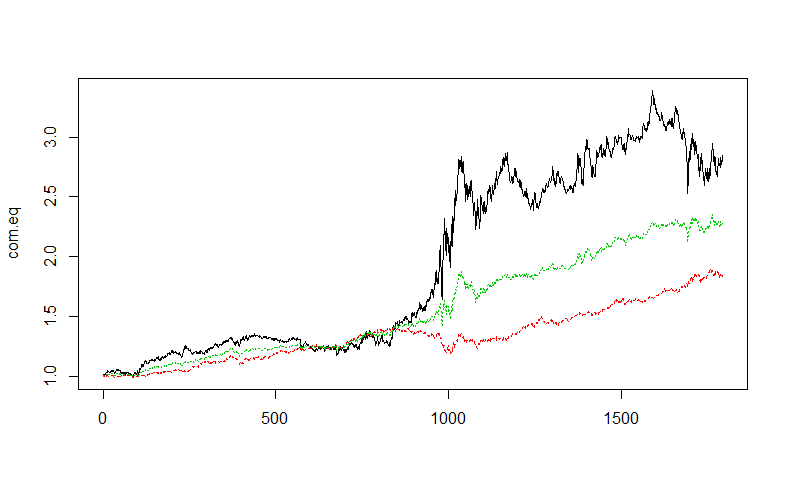 There are outliers to the right and it is more than 2 times the left most bar.This conforms to the definition of trend following as winners are bigger than losers. 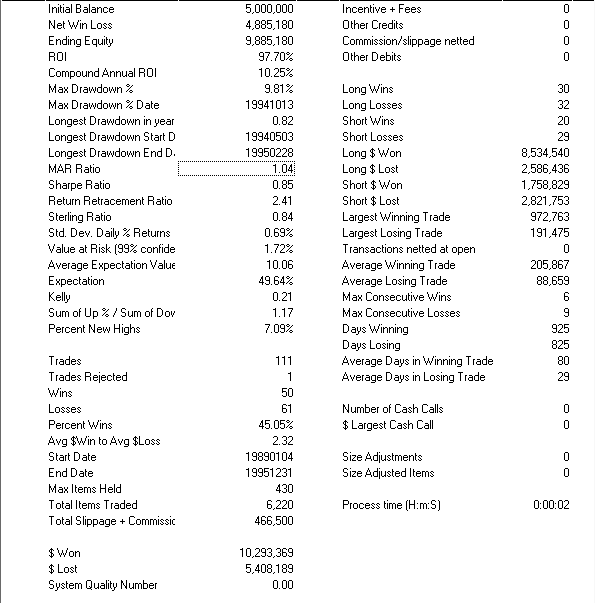 How can I efficiently let my winners run further while cutting my losses shorter? The idea here is to not focus on entries and the accuracy of your system. The main problem for me in the transition from discretionary trading to quantitative trading is the bad habit of wanting to make as much money as possible through being right as much as possible. 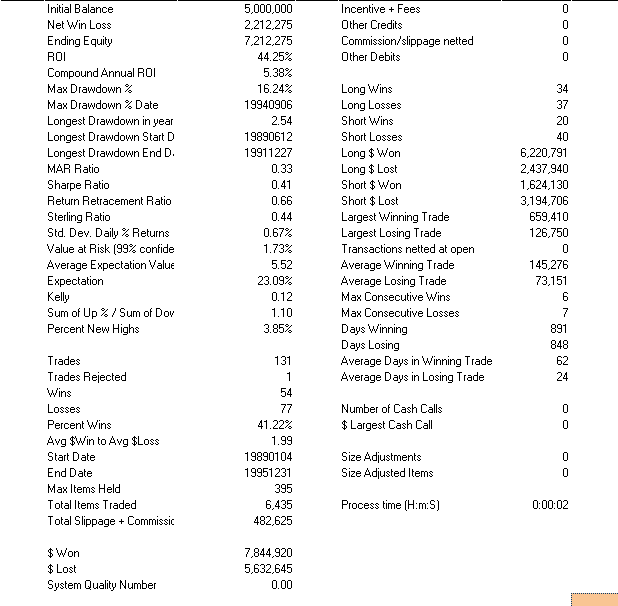 Just when I wanted to tighten my initial stop so to reduce my initial risk giving room for more contracts for my big winners, it so happened that it greatly increased the drawdown. Why? Well its simple, tighten stops for trend following system usually means increase stop outs when market volatility increases unexpectedly. There must be sufficient room for winners to be able perform. Below is the result of widening both initial and trail stop. 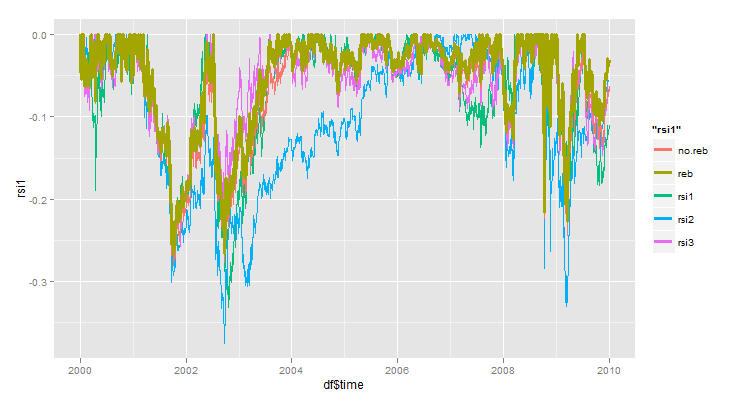 As you can see, although the distribution lost all the double digit outliers on the right, the central mean shifted more to the right which means better returns coupled with reduced variation.